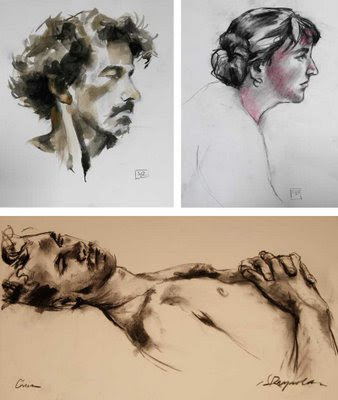 from top left: male profile, charcoal and gouache on Fabriano paper, 10" x 12"; female profile, charcoal and chalk on Whatman paper, 14 1/2" x 11"; Chris, charcoal on BFK Rives, 12 1/2" x 22"
Drawing the human figure from life is one of the great pleasures of being an artist. 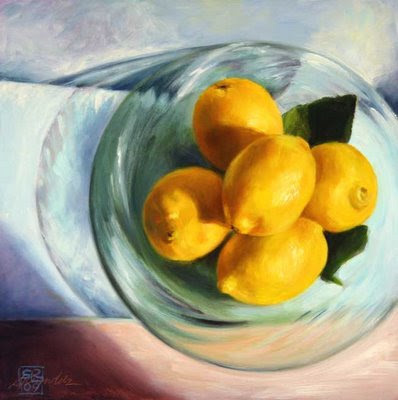 Nothing has quite the same sense of immediacy: landscapes and still lifes tend to hold still, but a live model is always a time limited challenge. These are a few sketches from some recent life drawing sessions. I am about to begin the second of my hand tool paintings. You can see the first and the story behind it here. This subject of this painting will be two mitre planes of my own—generously given to me by their maker, Bill Carter, and his wife Sarah. Since my first tool painting (done in exchange for a favour by my neighbour and plane maker, Konrad Sauer), these hand tools and the makers and users of them have captured my interest. 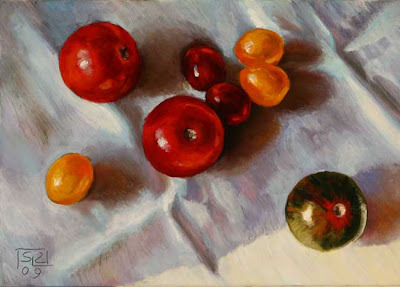 I’ve been on the lookout for examples of other artists depicting hand tools in their work. Recently, I was contacted by Bill Duce who came to my site via Konrad’s. He reminded me of Albrecht Dürer’s famous etching, Melencolia I, in which a winged female figure sits, chin on hand, with woodworking tools, including a hand plane, strewn at her feet and many other meticulously rendered elements rich with symbolism and allegory surrounding her. I have a book of Dürer’s work by French scholar Marcel Brion and I read his chapter on Melencolia I. In it Brion writes that there was a distinction at that time in the early 16th century between morbid and healthy types of melancholy, and that Dürer himself didn’t fear melancholy, but frequently submitted to it. Melancholy is not uncommon for artists and it is good to be reminded that in earlier definitions melancholy wasn’t viewed as a necessarily interminable or devastating condition, but rather as, in Brion’s words, “a salutary sort of restlessness, resembling the recuperative weariness of an artist after a productive period of toil”. How gratifying, I think, considering that I have often experienced dry periods of relatively melancholic inertia following intense periods of work—even while sitting in my light-filled studio surrounded by the tools of my trade, the evidence of my prior labours, and books full of inspiration. Reading beyond Brion, I found an article by Eric G. Wilson, a professor of English and author of “Against Happiness: In Praise of Melancholy”, in which, citing Keats, Handel, and Georgia O’Keefe as examples, he embraces the idea of melancholy as a possibly necessary precursor to inspiration that should not be denied. Wilson decries our contemporary addiction to happiness as a craze that leaves little room for the recuperative introspective gloom that so many artists seem to require. 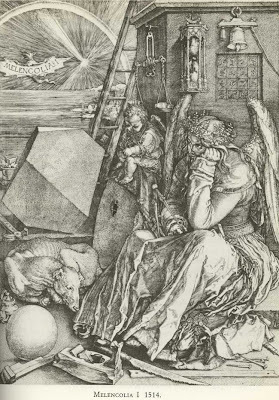 In Brion’s book he writes that Dürer would have been acquainted with a statement by Ficino that “all men who have excelled in art have been melancholy”, and maybe this allowed him to feel melancholic but never wholly succumb to despair. This morning, reading my Globe and Mail, I read Ivor Tossell’s column in which he writes that Facebook has created a strange alternate universe of perpetually happy people where no one wants to commit social networking suicide by admitting to any kind of melancholic impulse—where we are all poseurs in a collective game of putting our best persona forward. To this day I don’t know what to make of Facebook. I check in from time to time, but I find I honestly can’t keep up with or add to the constant chipper buzz. How can anyone find any kind of inspiration or even recognize one’s own thoughts in such a cacophony? I’ll take my salutary melancholy in the studio. To tie this back to hand planes, let me just say that I was in one of those recuperative states following an intense bout of forced creativity for Star Portraits when I decided to contact Konrad about that favour I owed him. Following my afternoon with him in his shop becoming acquainted with the tools of a trade altogether foreign to my own, inspiration, and a kind of awe at the ingenuity of people who chart their own paths in life, appeared and lead me down the most fascinating path—one that has found me with two mitre planes of my own and paintings to paint. Unlike Dürer’s melancholic figure, I’m inspired for the moment, but I won’t deny melancholy when she strikes again, I’ll just take heart, recognizing like so many artists before me that inspiration often arrives in the most unexpected places. 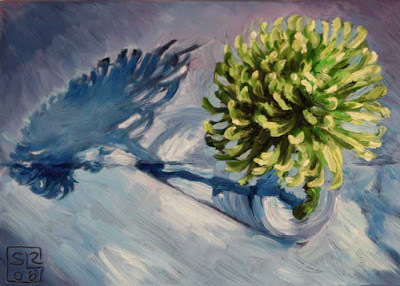 My last painting of 2008. I hope you had a wonderful holiday season. 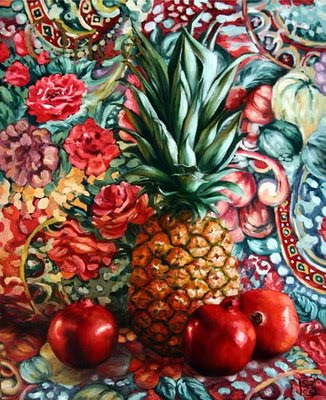 Once, a still life with pineapple and pomegranates, oil and gold leaf on plywood panel, 15 3/4" x 19 3/4"
This is the full painting that I used as the basis of my Christmas card this year. 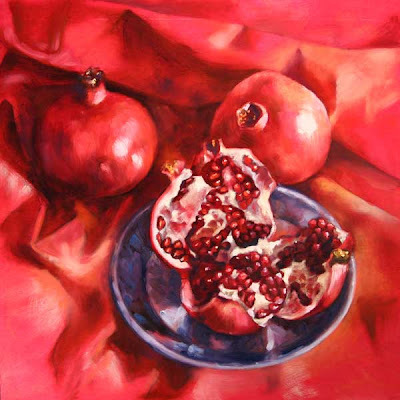 I was thinking about the incredible abundance of once exotic and rare fruits, especially in this frigid part of the world. 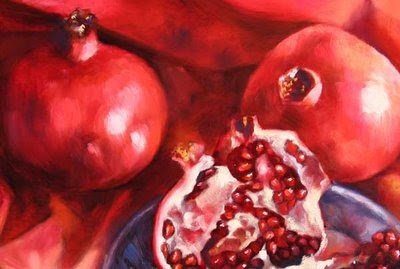 Given the unpredictability of our climate, our fuel costs, and our economy, to say nothing of the new focus on locally produced foods, I thought I'd paint some of these exotic-become-commonplace subjects before they become the exclusive fare of the super rich once again.